Origin of Species (6th ed., 1872), 421. “I have now recapitulated the facts and considerations which have thoroughly convinced me that species have been modified, during a long course of descent. This has been effected chiefly through the natural selection of numerous successive, slight, favourable variations; aided in an important manner by the inherited effects of the use and disuse of parts; and in an unimportant manner, that is in relation to adaptive structures, whether past or present, by the direct action of external conditions, and by variations which seem to us in our ignorance to arise spontaneously. It appears that I formerly underrated the frequency and value of these latter forms of variation, as leading to permanent modifications of structure independently of natural selection. But as my conclusions have lately been much misrepresented, and it has been stated that I attribute the modification of species exclusively to natural selection, I may be permitted to remark that in the first edition of this work, and subsequently, I placed in a most conspicuous position—namely, at the close of the Introduction—the following words: ‘I am convinced that natural selection has been the main but not the exclusive means of modification.’ This has been of no avail. Great is the power of steady misrepresentation; but the history of science shows that fortunately this power does not long endure. 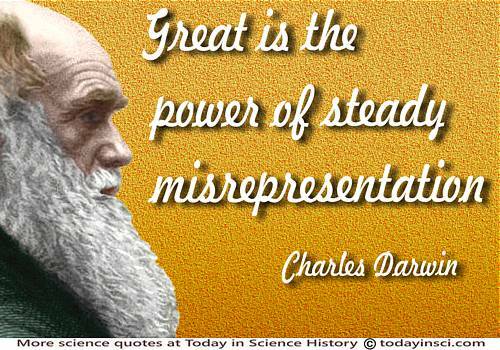 Thus, as he added in 1872, Darwin believed the power of misrepresentation does not long endure in science. 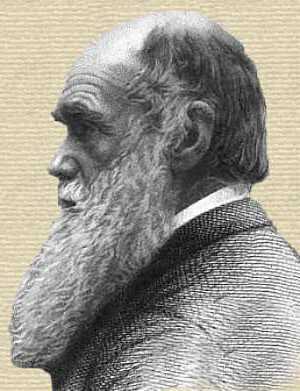 One can wonder how he would react if he came back to our time, so much more than a century since he expressed that remark, and observed the unremitting, perfidious efforts of creationists to inject their religious interpretation into the teaching in science classrooms. Once rebuffed, the creationists returned in the fabled emperor's transparent new clothes to preach the so-called “intelligent design.” Yet, as seen above, Darwin from his first edition, provides the eloquent words from a clergyman in his own time, expressing that belief in evolution remains faithful to a belief in the Creator. Sadly, we are now faced with too many politicians, energy moguls and biassed media puppets who present the same attitude of preconceived opinion towards climate change, for which time is running out—and the stakes are much higher—to accept and act upon the scientific facts. As we see so painfully in our own era, great is the power of steady misrepresentation.